═══════════════════════════════ R osalyn Margolis - Torah Writing Chair - Congregation Beth Israel, TX While my direct involvement with the support Rabbis at Sofer on Site was very limited, my opportunities to observe Rabbi Salazar were many. As head of volunteers for the project, I attended most every Scribing Day, having the opportunity to see Rabbi Salazar in action. He was not only delightfully informative, he was truly indefatigable! Every congregant left his presence spiritually uplifted as well as emotionally touched. The activities surrounding the scribing process was very impressive; it was obvious much time and talent went into their design and execution (thanks to our Chairmen). Our Torah Creation was truly a labor of love for us all! _________________ Joseph Chesnick, Jr. - Head Chair - Congregation Beth Israel - Houston, TX I had the honor of serving as co-chair, along with Roslyn Haikin, for our congregation's 160th Anniversary Celebration. The main component of this special year was the dedication of a new Torah to commemorate this milestone in Beth Israel's historic history, being the oldest Jewish synagogue in the State of Texas. In August, 2013, we wisely selected the professionals at Sofer On Site to lead us through the preparation and full process - including scribing dates, marketing, volunteer recruitment and fundraising. Upon the dedication of our Torah on December 19, 2014, we now have a chance to reflect on the success of this project. We are proud to report that we achieved, and in fact surpassed, all our goals - the primary one being our intent to "include" a record number of our Temple community and end the year with a strong feeling and closeness to our beloved congregation that will continue forward for many years. A wonderful by-product was the success of our fundraising efforts that will greatly assist us with projects deemed important by our clergy and lay leadership. Rabbis Druin and Salazar made it their responsibility to learn our community's culture and history which aided them in bonding with our congregants - they both played an integral role in the process as over 2,500 individuals scribed over the course of 17 dates during the past anniversary year - a remarkable number that gained momentum by word-of-mouth from those who enjoyed such a positive experience. 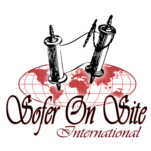 We wish to thank all the wonderful Rabbinic associates at Sofer On Site for their dedication and guidance which was instrumental to our success. ═══════════════════════════════ J oshua Sherbin, Head Chair - Temple Shir Shalom, MI Throughout 2014, we worked closely with Sofer On Site to develop and implement the scribing of a new Torah in honor of our temple's 25th anniversary. The SOS team provided insight, expertise and enthusiastic support. Rabbi Druin and Selwyn visited for scribing sessions and shared their warmth, intellect and zeal for Torah with our congregation. Our partnership with SOS played a significant role in the success of our Torah scribing project. _________________ Andre Douville, Executive Director - Temple Shir Shalom, MI From our initial meeting with Rabbi Druin to our Torah Homecoming ceremony more than a year later, the entire experience of writing a Torah and working with Sofer On Site was phenomenal. We did our homework. Our due diligence process included meeting with other scribing vendors and talking with multiple congregations that had worked with SOS in the past. SOS was clearly the best company in the market; their integrity and knowledge are unparalleled. From their expertise in strategic, short term and long term fundraising provided by Rabbi Druin to their dynamic, creative and cutting edge marketing support provided by Rabbi Goldstein combined with the wit and wisdom of their scribe Rabbi Selwyn, the 18 month process was truly a journey we will never forget. By writing our own Torah, one we can truly call our own, we literally inscribed our legacy for generations to come. None of that would have been possible without the guidance and relationship we had with SOS. ═══════════════════════════════ R ick Hollander - Temple Sinai Las Vegas, NV Our Torah project successfully bridged together the entire congregation as we also built out a new campus. As the President of the congregation at that time, It is rare when one strategy can transform and be universal no matter what demographic of our membership. On a personal note, While being present for much of the scribing, I saw our congregants transfixed by explanations of their scribing letter and meanings, with even a few miracles that some told me about after Rabbi Druin's interpretations and explanations. My one regret, was not having a journal for individual and families and the immediate and post scribing experiences. Watching this experience, I now understand "tears of joy" _________________ Rabbi Malcolm Cohen - Temple Sinai Las Vegas, NV Dear Rabbi Goldstein, Our experience with Sofer On Site was very positive. Rabbi Druin's presentations were well received. Sofer On Site was organized and helpful. The congregation received inspiration during their writing sessions. I wrote the letter raysh at the end of D'varim. The writing took place at the end of the dedication ceremony of the shul and the Torah. Writing the raysh, I felt great responsibility as the 'rosh" of the kehilah for helping the congregation write our next chapter. I am really appreciative of everything you have done for us. I have spoken to many congregants about the project and they were all positive. They enjoyed and were inspired by Rabbi Druin’s talks before the letter writing. The talks gave them new insight and knowledge into the whole process. The young people also appreciated this aspect of the project. There was great excitement for your visit to the Religious School. The most impactful piece was, of course, the actual writing. Many people spoke about their conversations with Rabbi Druin and how the writing was a “once in a lifetime” deal. Thank you for the contribution you have made to our community. L’shalom ═══════════════════════════════ M ark Malone - Torah Project Management Chair - Temple Shalom, Naples, FL. I had the pleasure to be on the "Our Torah" team at Temple Shalom in Naples, Florida. The staff at Sofer On Site were wonderful. They made the creation of "Our Torah" a fabulous and incredibly moving experience for everyone at our temple. This project brought our membership together in a manner which no other experience could have done. As a member of the team heading coordination this project, I had the opportunity to volunteer on several of the dates on which members of the temple wrote their letters in Our Torah. It was wonderfully meaningful for each and every member with whom I met. I cannot recommend this highly enough for any temple which has not yet created their own Torah. _________________ Caren Plotkin - Religious School Director - Temple Shalom, Naples, FL. Our experience with Rabbi Druin was wonderful. As Director of the Religious School I had many opportunities to create and plan educational experiences for various age groups of children. Rabbi Druin was a delight to work with and the students really enjoyed his lessons and interacting with him. Each program was successful and our students, staff and parents left with new knowledge and pride as they helped create a legacy for our Temple community. My husband and I wrote the letter "shin". This was incredibly meaningful to us. The experience touched us deeply. ═══════════════════════════════ t R abbi Alan B. Lucas - Senior Rabbi - Temple Beth Sholom, Roslyn Heights, NY Every Shabbat and holiday when we read from our exquisite new torah I smile as I think of the amazing process we went through in its creation. So many members of our shul family feel a deep connection with this torah and with torah learning thanks to Rabbi Druin. He lovingly guided us through this process. How wonderful is it when our B’nei Mitzvah ask, “Is this the torah that I wrote?” How remarkable is it that young and old now understand the meaning of torah and the mitzvah of writing a sefer torah in a way they did not before. Thank you Rabbi Druin and thank you Sofer On Site not only for our wonderful new torah, for a successful fund raising program but for a Torah learning and a Torah living experience. A wonderful by-product was the success of our fundraising efforts that will greatly assist us with projects deemed important by our clergy and lay leadership. Rabbis Druin and Salazar made it their responsibility to learn our community's culture and history which aided them in bonding with our congregants - they both played an integral role in the process as over 2,500 individuals scribed over the course of 17 dates during the past anniversary year - a remarkable number that gained momentum by word-of-mouth from those who enjoyed such a positive experience. _________________ Cantor Ofer Barnoy - Temple Beth Sholom, Roslyn Heights, NY Our experience was wonderful. Rabbi Druin was a pleasure to work with and our members found him inspiring, educational and entertaining. With his guidance, we were also able to meet our fundraising goals, which were ambitious. Rabbi Druin taught us and encouraged how to focus on the spiritual essence of writing a torah and assured us that the fundraising dollars would naturally follow. We followed his advice and found that he was "right on the money" _________________ Pearl Halegua - Torah Project Chair - Temple Beth Sholom , Roslyn, N.Y. Our goal was to not only have a fund raiser but to also give each of our members the opportunity to fulfill Mitzvah 613, to write a Sefer Torah. This was so important to our committee that we stated in our literature, no member was required to make any donation in order to scribe. Rabbi Druin, our sofer, opened up a lot of hearts while scribing with each of our members. Individuals constantly found meaningful connections with the letter they randomly came upon to write. Each was moved by not only the experience of writing, but everyone walked away with a pearl of wisdom either about the teaching of torah, how it was made or a midrash about their letter. Everyone grew in some way. Rabbi Druin was also wonderful with our children, especially our pre schoolers. He made the experience joyful , as well as educational. Torah was truly our theme last year and what is beautiful, is that every Shabbat when we take it out, our congregation feels connected to it in so many ways. Our bnei mitzvot each have a letter they wrote in the torah from which they read for their simcha. The new torah is so light compared to our old ones, that lifting it is a possibility for those of various strength. The calligraphy is easy to read, which makes so many very happy. It is truly reader friendly. Writing this torah was a win, win experience; not only did we benefit from it financially, but our congregants benefitted spiritually on so many levels. Temple Beth Sholom truly "took hold of torah" with this project. While looking to create a meaningful fundraiser the concept of writing a torah was brought up . Some said we don’t need another torah …others said we need to write a new Torah for tthe next generation.